Nothing could beat the taste of freshly prepared chicken croquettes. It smells and tastes awesome! 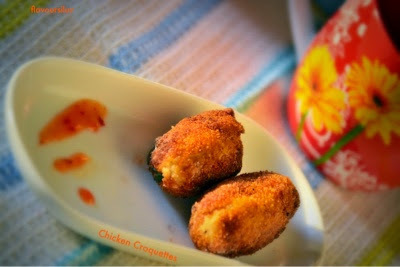 I love to serve croquettes as a starter or teatime snack. 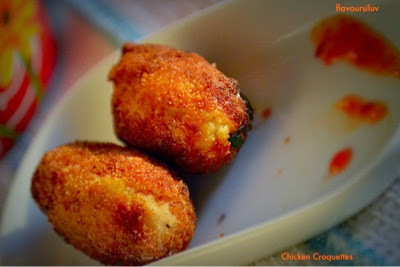 The name croquette is likely derived from the french verb croquer, which means to crunch. Crispy and crunchy outside and super soft inside. Cook the chicken with all the other ingredients listed. Reserve the stock and shred the chicken pieces. In a saucepan, heat milk and chicken stock and add parsley leaves into it. In another heavy bottomed pan, melt butter and add celery. Saute for 2 minutes, then add flour and saute till the raw smell goes. Add hot milk and stock mixture into it. Stir continuously till the mixture become thick and smooth. Now add enough salt and pepper into it and fold with shredded chicken. switch off the flame, allow to cool and refrigerate for 30 minutes. When it is time to fry, take a small ball size of the mixture and shape into cylindrical shape. 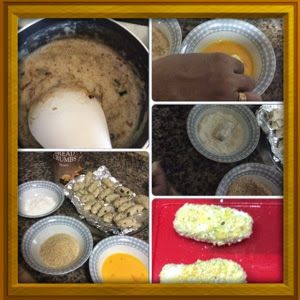 Dip in beaten egg and roll in flour, again dip in egg and roll in bread crumbs. When oil is hot enough drop a couple of croquettes and fry till golden brown. Drain onto kitchen towel. Serve warm.